It’s gotta be hard for a Superhero to find true love. They spend 75% of their time with deranged lunatics trying to chain them up and dip them in vats of acid or industrial waste. Where do those villains find those big vats of industrial waste anyways? Does OSHA have an allowance for industrial waste as long as it’s in large vats with open tops? After watching this video I have to say, this is perhaps the sweetest Batman I have ever seen. Yep . . . The Goddamn Batman hooks up. Who knew that Bruce just needed a goofy girl, that poots unexpectedly in his life? 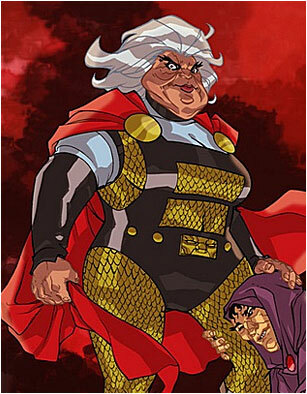 My luck would get me hooked up with Granny Goodness. At least there would be pie, lots of delicious pie. So go ahead and click that mouse (If you haven’t already) that way you do and enjoy. The same group that brought us “A Very Zombie Holiday” really delivers with “Super Harmony.” Starring Team Unicorn (Rileah Vanderbilt, Milynn Sarley, Clare Grant, Michele Boyd) alongside Dave Foy, Derek Mears, Colton Dunn, Bryan Morton. Directed by the incredible Sean Becker (Director of “The Guild” and “A very Zombie Holiday”) and written by the talented Colton Dunn. They catch that goofiness of the E-Harmony commercials.